On 31 July 1955 Mr J. C. Cook of the Sunderland club became 5cc European Champion at the superbly situated track in Monza and on 04 August 1957 at the now long defunct Dortmund track was again 5cc European Champion running his very competitive Dooling 29 powered spur gear car. 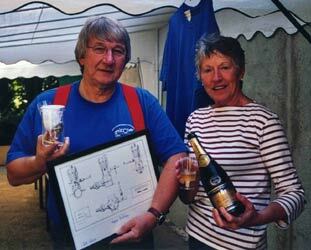 In 1958 a number of UK competitors attended the European Championships in Witterswil near Basle, Ken Proctor placing a creditable second in 2,5cc and Jack Cook placing sixth in the 5cc class. 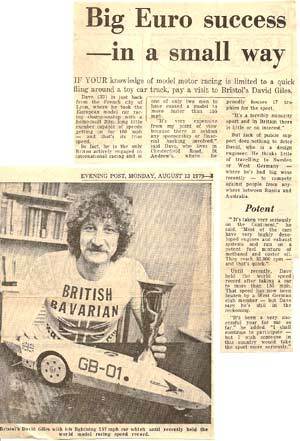 From that time onwards there seems to have been little or no mention of UK participation in international tether car competitions. The last recorded UK competition results (at home or overseas) I have found either in Model Engineer or Model Maker is a reference in Model Maker to the M.C.A. National Speed Championships held at Blackpool in September 1959. On this occasion, Jack Cook was placed second in a closely fought battle with Mr E. P. Zere, well known for his ‘ZN’ tether car components. The reason for the title and the above preamble? Well, when I began entering international competitions, a number of participants told me they remembered Mr Jack Cook with much affection, he was particularly known for his 5cc cars, and this was the class that I was drawn to and an engine size which I had used previously with some success in class ‘B’ control line team racing. So in the eyes of these folk, I was Jack’s successor! Now let’s fast forward to February 1977: I had just been assigned to MTU Aero Engines working as a development engineer on the RB 199 aero engine project and had moved into a flat in Munich. I had learned through friends in Sweden and America that tether car racing was still alive in continental Europe and through contacts in the model aeroplane hobby and a measure of good fortune, I was able after a few weeks to contact Adi Malik, a former control line speed flyer and member of the West German team which was dominant in C/L speed and team racing some years earlier. Adi had changed his focus from aeroplanes to tether cars, and actually lived in Munich, so a friendship started which is ongoing to this day! It was arranged that Adi would visit me and bring along his 2,5cc car, as I really had no idea what a current car looked like I imagined, perhaps naively, that they still looked like a Dooling Arrow or a Bottoms Up, or at best like Frymire’s Frypan. For aesthetic reasons, I was appalled at the appearance of the machine placed on our dining table during that first evening! 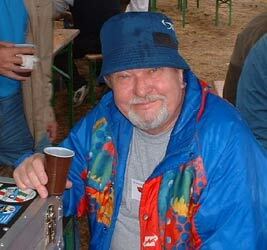 Equally, I was excited at the prospect of attending a race meeting at Kapfenhardt, set in a beautiful wooded valley in the Black Forest. It is the nearest track to Munich, approximately 800km (500miles) away, but I could see at first hand what happened at a race meeting and whether I wanted to get more deeply involved. I was amazed at the speed of the cars, the sound of the piped engines and the superb organisation and attention to detail, particularly with respect to track cleanliness and safety for competitors and spectators alike. At this meeting I was introduced to Horst Denneler, without doubt the most prolific supplier of machined parts for modern cars, and placed an order for one of his 5cc car kits. Although all major parts were finish machined, it is far more than a ‘kitchen table’ project to complete a speed car. 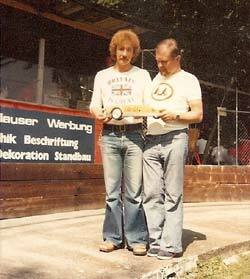 Also at that time, I bought rear tyres from Arne Zetterstrom in Sweden, considered to be the best available. Luckily, Adi had kindly offered to help me build the car and also to prepare the OPS 29 engine which we collected straight from the factory in Italy. He had (and still has) an excellent workshop and the car was duly completed, although all engine work was strictly under Adi’s control. This motor became effectively the first “MOPS” – Malik tuned OPS 29 – which, in its various versions, dominated the 5cc class for many years until the arrival of the Picco and STL engines. 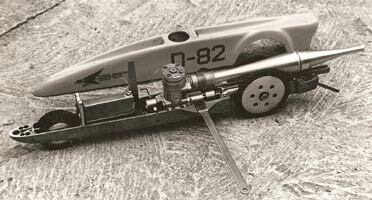 Machine new venturi 10,5mm bore with central fuel pickup. Blend out inlet tract. Chamfer leading and trailing edges of disc cut out. Slot in head of centre pin to improve lubrication. Check for squareness of all bores, faces and mounting lugs. Match boost port channel to port in liner. Match exhaust outlet and exhaust outlet stub.Lap the bolting faces of crankcase and outlet stub to give gas tight seal. Tap out head screw holes to take M4 brass machine screws. Machine new component from high strength aluminium alloy. Tight plug fit in crankcase. Remove sealing ring and grind away either side of crankpin to increase counterbalance. Cut slot in skirt to match boost port. Form taper on top edge 2mm x 20mins. Heat treat by raising to 120 degrees C & allow slow cool to ambient. Repeat 3 times. Lap to final fit in sleeve. Increase exhaust timing to 175 degrees, lightly stone the inside edges of the ports and lightly radius the outside edges as appropriate. Turn a relief on the top edge of the top flange to reduce possible bending of the flange. Modify original cylinder head to form a clamp ring. Machine a new head button of trumpet form, to accept Super Tigre sleeve nut type plugs. Squish clearance 0,3 – 0,35mm, squish band 1,5 – 2,0mm wide. Head volume 0,37cc. The pipe was the standard OPS 5cc pipe supplied with the engine, made from aluminium and connected using high temperature silicon tubing. After a detour via Nuremberg to discuss pipe dimensions with Otto Stroebel, at that time still running tethered hydroplanes, the first event for the new car (and me) was the Pentecost meeting at Kapfenhardt over the weekend of 13/14 May 1978. Initial running-in took place under Adi’s supervision and after inspection to ensure that the piston/cylinder was bedding in correctly, a speed in the competition of 217kph was achieved, to give me 7th place. Four further events followed during the month of June: Hanover; 223kph, 3rd place, Gallarate; 206kph, 7th place, Lyon; 234kph, 1st place, Basle 240kph; 1st place. In July we traveled to Monza and achieved 237kph and 2nd place. It is surely no surprise for me to say that traveling to competitions when one is already on mainland Europe is far more practical than traveling from the UK. The 27th European Championships were due to be held in Gävle over the weekend 05/06 August, so I made the long journey from Munich to Kiel by car, then by ferry to Gothenburg, then onward by car to the competition. It was a real eye opener to see so many entrants and the cream of the tether car drivers from both eastern and western Europe. The result for me was a satisfying 239,26kph and 4th place, plus the establishment of friendships which have continued to this day – one of the benefits of international competition. Although the European Championships would normally be the high point of the season, for me it was the next meeting I attended, in Basle on 27th August. The result was a first place at 253,271kph which was a new world record in the 5cc class! My racing season continued with meetings in Gallarate, Hanover, Kapfenhardt and Budapest. However as was permissible within the regulations at that time Adi Malik ran my car by proxy at the latter two meetings. Unfortunately, at the Hungarian event the rotor disc disintegrated, causing a lot of damage to the moving parts of the engine. Luckily the motor was repairable and over the winter of 1978/79 we were able to refurbish it. Although the exact date eludes me, at around this time I returned to the UK to face a rather uncertain future. 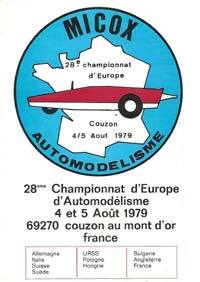 I knew that I would be unable to continue racing on a regular basis, but was determined to enter the European Championships in 1979, due to be held in Lyon, at the Club Micox track at Couzon-au-Mont D’Or. As is normal practice before any race meeting, the car was completely disassembled and rebuilt, particular care being taken when rebuilding the engine. The meeting was scheduled for the weekend of 04/05 August 1979, and we duly arrived after a protracted journey using French national highways – quite an undertaking even just 30 years ago, as the French auto route network was nowhere near as comprehensive as it is now and my car at that time was a rather elderly VW Beetle! The competition was very strong, with entrants from eight different countries, but I was in first place at the end of the first round with a speed of 250,69kph. This was very pleasing as mine was the only 5cc car to break the 250kph barrier, something of a watershed at the time. In the second round the top four entrants all improved their times, with my car recording 252,45kph to hold on to first place, so at my second attempt I had become European Champion in the 5cc class. And just for the record, the one man England team managed 6th place in the team competition with 400 points! Obviously a very pleasing outcome, and a tribute to Adi Malik’s workmanship and my ability to prepare and run the car as I had been taught. 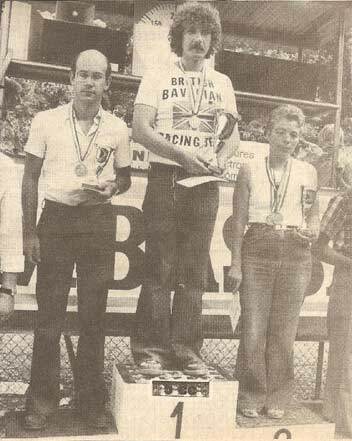 Even after all the intervening years, I can still recall the pleasure of standing in the number one position on the podium! Interestingly, the event was well reported by the local press and there were many spectators all over the weekend, in complete contrast to the situation now. Although I still retained my interest in tether cars, I was unable to continue attending competitions regularly, but did compete in the combined European and World Championships held in Kapfenhardt in 1980, but with no possibility to practice and with limited workshop facilities, it was an uphill struggle. Not long after this my work took me much further a field for some 11 years so over time, tether car racing became a receding memory……until the summer of 1997 when I attended the European Championships in Basle, purely as a spectator and with no intention of becoming actively involved…….and the rest of the story has been adequately documented elsewhere! Fast forward again to the 21st Century……..and we’re still going strong!